Everyone has a hero:”I went home and listened to Jimmy Rogers in my lunch-break/ Bought five woodbines at the shop on the corner/ And went straight back to work.” This snipped from the lyrics of ‘Cleaning Windows’ gave an insight to one of Van Morrison’s, and it’s not surprising Morrison likes to drop in to hear Ronnie Greer play at McHughs in Belfast during the bluesman’s regular gigs in the city. 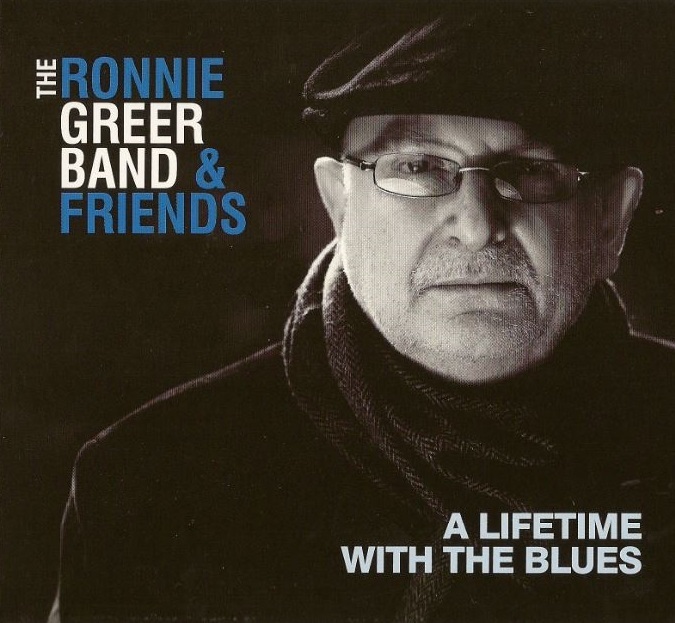 Ronnie Greer, too, might also have been listening to Jimmy Rogers in his lunch break. you could do a lot worse. Greer certainly knows the great Muddy Waters man’s playing like the back of his hand as the opener ‘That’s Alright’ spreads out and the blues kick in like Shalimar, Greer’s classy light, highly nimble, but very real blues style accompanied by his own gruff vocals sounding all the more authentic after the smooth flugel solo of Linley Hamilton on ‘Sensitive Kind’. Anthony Toner’s guitar comping behind Ronnie on the same Cale number opens up the subtlety of the song and Colm Fitzpatrick has the “hide-in–plain-sight” groove down to a tee. Greer waited until he was 62 to make this his debut solo studio album, and you would guess he’ll be making more pretty damn quick if the success of A Lifetime with the Blues is anything to go by. Recorded at the keyboardist John McCullough’s studio in County Down the band sound as if they could play a proper lounge (for instance channelling some great KC on ‘Roll ’em Pete) or romp away with the prime spot at any jazz club you care to think of starved of the blues as many jazz places are these days, unfortunately. Grainne Duffy adds some Janis Joplin-like style to ‘Never Make Your Move Too Soon’, and Dave Howell’s tenor solo on the Jennings/Stix Hooper song has an authentic chitlin’ circuit feel. Highlights? Well that’s easy: as well as Greer’s lovingly honed licks and runs listen out for Ken Haddock on ‘Dangerous Mood’. A big man with a big heart, and a sound that’s steeped in the blues just like all the fine musicians here.